McRae, a three-time Brisbane premiership player, arrived at Collingwood at the end of 2010 after spending four years at Richmond and one with the Lions. The small forward made a name for himself with his determination for the contest and his fierce tackling. At his peak, McRae was one of the game's most reliable and creative players around goal. He represented Australia against Ireland in the International Rules in 1999, and played in two premierships against the Magpies in 2002 and 2003. McRae oversaw the development of the club's younger players at VFL level in 2011. His role was bolstered in 2012 when he was joined by Anthony Rocca, Dale Tapping and Mitch Hahn in the development coaching office, while Steve Grace joined the fold when Hahn left for Brisbane at the end of 2013. McRae's dedication and proven ability to develop young footballers was recognised by the AFL Coaches Association when he received their inaugural Development Coach of the Year Award. The gong recognises the outstanding commitment, service and innovation in developing and preparing young players for AFL football. Playing Career: Brisbane Lions 1995-2004 (195 games, 232 goals). Highlights: Brisbane Lions Premiership Side (2001, 2002, 2003), South Australia State of Origin Representative (1999), International Rules Series (1999), Brisbane Lions Grand Final side (2004). 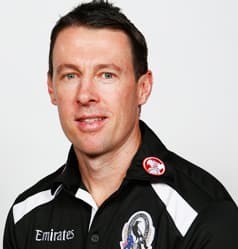 Coaching Career: Richmond 2007-2009 (development coach), Brisbane Lions 2010 (development coach), Collingwood (Head of Development) 2011-2014. Coached By: Robert Walls (1995), John Northey (1996-1998), Roger Merrett (1998), Leigh Matthews (1999-2004). Coached With: David King (2007-2009), Brian Royal (2007-2009), Terry Wallace (2007-2009), Wayne Campbell (2009), Jade Rawlings (2007-2010), Adrian Fletcher (2010), Manny Lynch (2010), Beau McDonald (2010), Michael Voss (2010), Paul Licuria (2011), Mick Malthouse (2011), Mark Neeld (2011), Scott Watters (2011), Nathan Buckley (2011-2014), Matthew Lappin (2011-2014), Tarkyn Lockyer (2011-2014), Anthony Rocca (2011-2014), Rodney Eade (2012-2014), Mitch Hahn (2012-2014), Ben Hart (2012-2014), Robert Harvey (2012-2014), Dale Tapping (2012-2014), Scott Burns (2014), Steve Grace (2014).